M headed back home for a wedding over the holiday while I continued to work away. However, I took a day off and ran away (with the pup) to the ocean to enjoy a little time with the cool weather and lack of people (strange for the beach, I know- but it is exactly what I needed). I’m discovering so many lovely places in Northern California. I packed a picnic for myself and over the next couple of post I’ll be sharing the recipes. Today’s recipe is for this gem of a sandwich. I love the saltiness of the olive tapenade with the slight sweetness of the tomato and goat cheese. 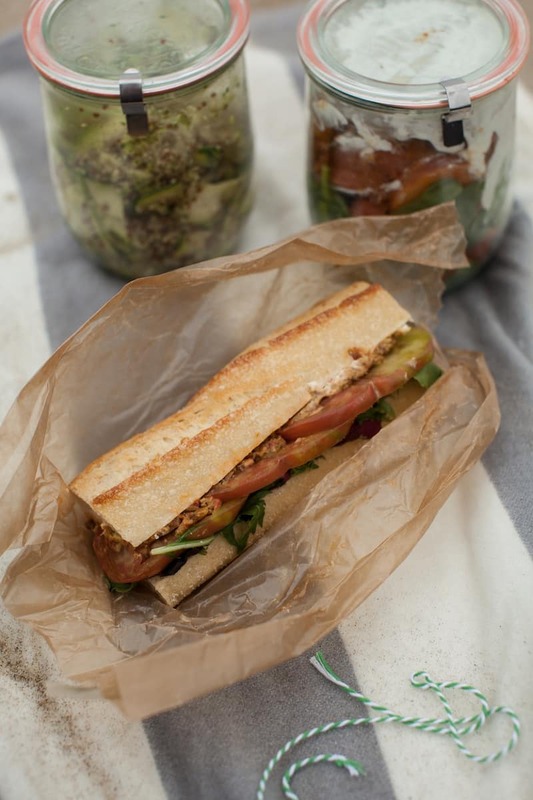 This sandwich will be a regular in my picnic (and normal day) rotation! Pulse garlic in the food processor until minced. Add olives, roasted red pepper, olive oil, sea salt, black pepper, and lemon juice. Pulse until olives are in small pieces. Build sandwich with lettuce, tomatoes, goat cheese, olive tapenade, and mustard. Makes enough for a few sandwiches but keeps well in the refrigerator for a few days. Such a cute idea and this sandwich sounds amazing. I love the olive tapenade and the goat cheese. So yummy! I could just sit here staring at your beach pics all day – I can totally understand why it was the perfect antidote to the craziness of life! I go on and off capers too, that tapenade recipe sounds delicious. Love the look of that picnic, Erin -the drive alone looks lovely. And that sandwich?! Picnic perfection. Poor Illinois. NO chance competing with sights like these… A picnic alone sounds like my kind of relaxation, too. Beautiful. Ah…Limantour. One of my favorite places. So beautiful, Erin! Tapenade + tomatoes at the beach — so wonderful! This is one of those “now why didn’t I think of that?” yummy-looking sandwiches–thanks for thinking of it! And Limantour is our favorite beach, fog or shine. It’s our escape when one of us needs to decompress, or a place to celebrate something personal. Oh my, what an incredible beautiful get-away! 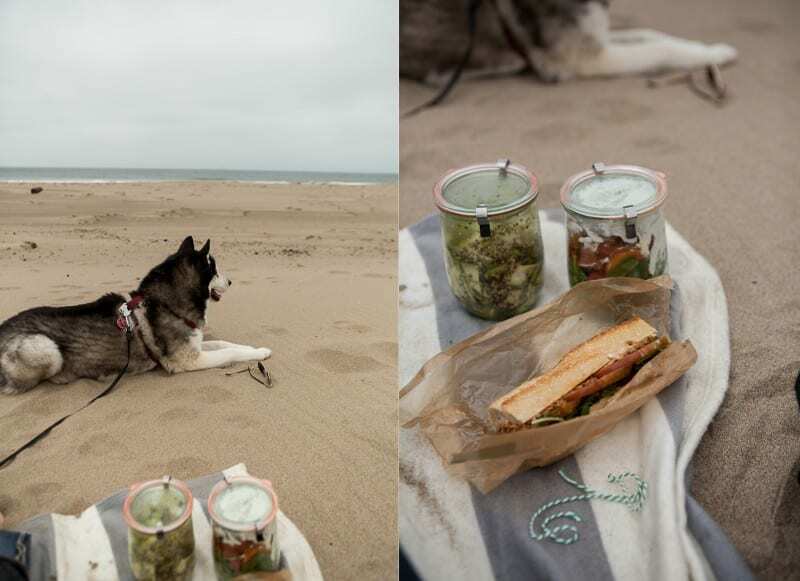 I am loving those jars and the paper you wrapped your sandwich in–such a perfect image, especially with the sand, the blanket, and your pup–what’s his name, by the way? Gorgeous photos! And that sandwich looks pretty tasty, too. This is the kind of sub I always wish sandwich places offered on their menus! 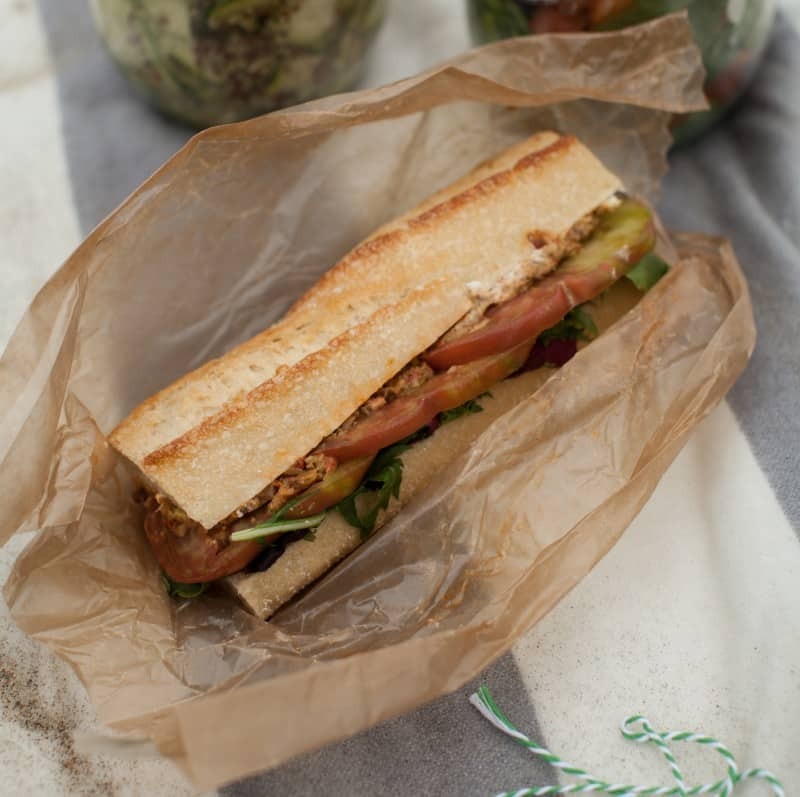 Perfect sandwich for a Summer picnic and your photos are lovely! I’m so glad to hear how much you’re enjoying NorCal! It’s a pretty beautiful place to live 🙂 Your picnic looks lovely. making note of this for my next picnic!! Looking forward to the salad recipes in weck jars!! They look yummy too! Limantour Beach is one that’s close to my heart and today — so far away from it — it was wonderful to see here; it brought a bit of home. I love it on foggy days and fair; each has its own special aspects. Have you been to Kehoe Beach? That’s my absolute favorite beach in Pt. Reyes, and it’s great for dogs. It’s along the road out toward Pierce Pt. Ranch, and you have to walk in about 3/4 of a mile on a path through a field … magic.